According to the Daily Mail: British Royals face ‘tax nightmare’ as IRS use Meghan’s American citizenship to line up a US income tax raid on Royals family multi-million pound fortune. The Royal Family faces a tax ‘nightmare’ as US officials examine whether Meghan and Harry owe them a slice of their multi-million pound fortune, according to reports. The Duchess of Sussex is still an American citizen so has to pay US income tax in the US, and this could extend to anyone else she draws money from, including her husband. 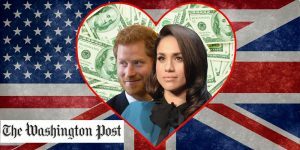 This could deplete both her $5million US fortune and Prince Harry’s main source of private wealth, a £300,000-a-year trust fund on which he pays UK income tax. The probe could even extend to the Queen and Prince Charles as they provide funding for the couple, aides told the newspaper, which reported that the royals are set to employ a team of US financial consultants to deal with the issue. ‘We’re looking at a level of financial exposure the Royal Family has never had to face before,’ one of the aides said. The US Internal Revenue Service (IRS) is known for being extremely strict in tracking down people they believe owe them money. Meghan is reportedly living in the UK on a family visa, but she will have a complicated tax status as long as she remains a US citizen. Tax laws mean that even if Los Angeles-born Meghan lives full-time in the UK, she will still have to file a US return every year. US officials are set to be scrutinising Meghan’s finances as part of a probe that could also include the Queen. Meghan’s last return, which would have needed to be submitted to US authorities by April 17, would have detailed any money she and Harry have made since they began living together. Of course this raises the tantalising prospect of Uncle Sam getting a look behind the velvet curtain – and seeing the private finances of the Royal Family. 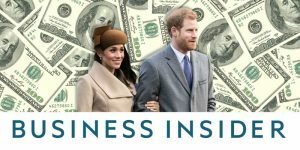 Meghan has to give the US taxman full details of her finances if she and her husband-to-be have joint assets, bank accounts or offshore trusts. Perks she receives by joining the Royal Family such as the use of Nottingham Cottage, the grace and favour property in the grounds of Kensington Palace where she will live with Harry, need to be valued and declared, unless she is paying rent herself. Duchess or no duchess, when it comes to the IRS, Meghan is like every other American citizen. Each year she must file her tax return and pay any US income tax she owes to Washington. The US income tax system is citizenship-based, so as an American it doesn’t matter where in the world you live and work – your tax affairs are always Uncle Sam’s business. She may even have to declare personal items such as her engagement ring and wedding dress. The diamond engagement ring Prince Harry gave Meghan has been valued at over £71,600 ($100,000) by royal watchers. 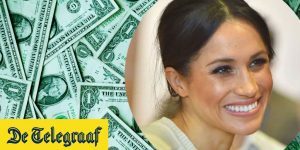 Because it is classified as a gift ‘from a foreign person’, Meghan would have to declare it to the IRS on a Form 3520 or suffer a £7,160 ($10,000) penalty. Kensington Palace declined to comment. The IRS has been contacted. We, the founders of Americans Overseas, were born in the Netherlands and obtained our American nationality through our (American) mother. When we heard about this for the first time around 2013, we were in total disbelief (it can’t be true! ), anger (how can they do this? ), fear (am I going to get fines or pick up other problems? ), and panic (what should I do?). It is (unfortunately) true that there is an additional American tax levy. But there’s no information from local government, and when approached, the consulate referred us to the IRS, and the IRS was impenetrable. That’s why we started this initiative to help people from all over the world by providing proper information to avoid unnecessary panic, and offering help free of obligation and free of charge. If needed, we have a network of affordable professionals (accountants) who can help you with your tax obligations. If you have more questions about US income tax you can contact us at Americans Overseas.